Understanding the requirements of pastures in your system. White clover is the base legume of New Zealand dairy pastures sown in a wide range of pastures and management systems. It has a high nutritional value and fixes atmospheric nitrogen (N) to make a substantial contribution to the growth of companion grasses. A summer active, perennial legume, white clover has an optimal growing temperature 5 degrees higher the ryegrass. The rate of leaf appearance of clover leaves is mainly influenced by temperature, and leaf size is influenced by light - shade is detrimental to growth. The clover leaf does not regrow after grazing. A stolon branches from nodes and spread out in the pasture. Light intensity speeds up the production of these daughter stolon's. White clover is generally more resistant to grazing than ryegrass, the energy reserves are stored in the stolon and root, the stolon stays close to the ground so is rarely grazed. Clover growth habit means that there will be leaves at varying heights from the ground, some of which will not be grazed. White clover fixes N in pastures, improving total pasture production. White clover maintains high quality in late spring and summer. Animal performance can improve markedly with increased cover content. White clover will be preferentially grazed due to its high feed value; however, it has more resistance to hard grazing than ryegrass with some leaves left after a grazing event. Ongoing pasture management influences clover content in pastures. Leaving ryegrass pastures past the 3-leaf stage will shade clover from light. This is particularly an issue in late spring when grass growth rates are very high. Excessive use of N fertilizer (>200kgN/year) will give a competitive advantage to grasses, which may result in shading out clover. These two types of ryegrass are described together because they are used in similar situations. Large leaved, and cool season active these ryegrasses are highly valued for their winter and early spring production of high quality forage. Annual ryegrass is commonly sown in autumn as a 6-8 month winter/spring crop. In warm, summer dry areas it will persist only to flowering and seed set in early summer. Cultivars can persist longer in mild, moist summer climates with low insect pressures (e.g. irrigated Canterbury and Otago, and Southland). 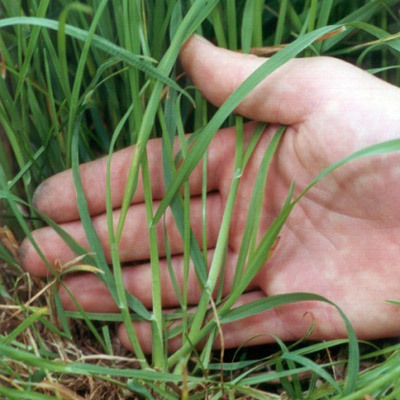 Italian ryegrasses are more persistent than annuals, typically lasting 12-18 months in drier conditions, and 2-3 years in mild, moist summer areas. These species are appropriate for between summer crop cycles. The both establish very quickly and in conditions are typically ready for a first light graze in 4-6 weeks. When sown in March as a winter crop, both species produce a similar amount. Trial data suggests they can grow 7-8 t DM/ha over 6-8 months. Sowing in late autumn will reduce their DM yield. 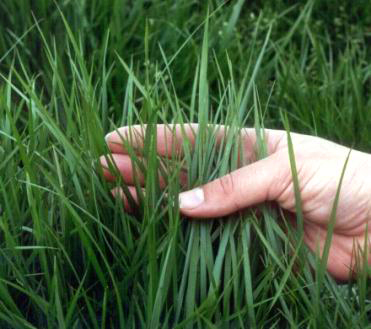 Tall fescue is an alternative to perennial ryegrass as a permanent pasture, which does best in heavy soils, and needs specific management to maintain its feed quality. A perennial tufted grass with erect unbranched tillers. An autumn tillering plant. The optimum temperature for tall fescue is 26°C, with growth continuing into mid 30°C temperatures. It has a larger root system than ryegrass which provides tolerance to some insects, less pugging damage and less pulling by cows. It cannot be used in a mix with ryegrass. Feed quality and palatability of tall fescue declines markedly when pasture mass exceeds 3000 kgDM/ha in the spring and summer period. Pre-grazing mass needs to be lower than ryegrass which means more frequent grazing. Maintaining a lower pre-grazing mass by frequently grazing (e.g. 12-18 days) from late September to November has the benefit of reducing stem development. The same post-grazing residual target can be applied to tall fescue pastures as ryegrass pastures (1500-1600 kgDM/ha). It is not recommended to carry autumn-grown tall fescue through to the spring. It has been found to have low palatability as a function of the age of the leaf. It is better to graze early winter and rely on fresh growth for the spring. Cocksfoot is the most persistent perennial grass, most commonly used in summer dry areas as a minor component (e.g. 2-4 kg/ha) of ryegrass/clover pastures. It tolerates summer dry conditions, a range of insects and moderate soil fertility. Older cultivars can dominate pastures, reducing clover levels and digestibility. Lower digestibility than other grasses. Good grazing management is required to keep palatability but overall it has a lower feed quality than ryegrass. Cocksfoot is grazed at the 4-5 leaf stage of regrowth to maintain quality. Useful for persistence of permanent pastures in summer dry areas. Limited winter growth but good dry matter yields possible through summer. Although subterranean (or sub) clover is the most widely sown annual legume in summer dry areas of New Zealand, it is rarely suited to dairy farm systems. It must be allowed to seed in the first year, and in autumn pastures need hard grazed and kept very short (e.g. <1000 kg DM/ha) to allow space for seedling regeneration. It establishes in autumn and grows from rosettes to produce long, horizontal stems during late winter and spring. Sub clover buries it seed. Self-pollinating flowers grow off runners on the soil surface and then the seed containing burrs push into the soil to bury the seed to survive the summer. Sub clover is often sown with white clover in a pasture mix in very dry environments, and will survive in conditions too dry for white clover. Sub clover has its highest yields in late winter and early spring. Grazing pressure during flowering in the first year of sowing can affect seed set. Summer grasses must be controlled to minimise competition for newly germinating and establishing seedlings in the autumn. A short-lived, tap rooted plant with dull hairy foliage, usually bearing a distinct leaf mark. Most common in summer dry areas, where the tap root allows it to tolerate dry periods. It performs best under moderate stocking rates, long summer grazing rotations or hay production. Under high stocking rates or fast summer grazing rotations its persistence is reduced. Red Clover has poor winter growth but can provide superior DM production to white clover during dry summers. Red Clover usually persists for 2-4 years in mixed swards. It conserves well as silage and is usually mixed with grasses, other legumes, and grazing herbs. 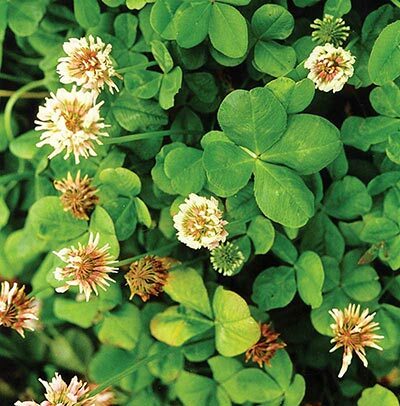 It is often included with white clover in pasture mixes. Because of it upright growing habit, red clover does not tolerate hard grazing regimes. The species must be established at a sufficient plant density to contribute well in pasture as it does not spread like white clover, nor reseed readily.